The Color Tool, found in the Skin Editor, lets you quickly change the colors of a skin or a selection of elements. The Color Tool is accessed by clicking on the Color Tool button in the Skin Editor’s Toolbar. It is grouped by color or color value. For instance, all elements that use the color black at full opacity will fall under the same grouping. While an element that uses black but with transparency will fall under a different grouping. You can use the tool to simply view the current color scheme of a skin. If you do not select anything in the skin and simply open the tool, you’ll see something similar to the image above which is showing the color scheme of the simplex skin. Click on the black disclosure triangles to see which elements use which colors. A common color in the simplex skin is black. So, under the black color heading you’ll see a list of elements using that color. The color tool will also show you colors being used by non-elements, or parts of the skin that are not listed in the tree. For example, it will show a Map element’s radar beam color or the color change created in a Logic Block. You can use the built-in simplex skin to test with. Open the Color Tool without anything selected in the skin. Follow instructions for Change the color of multiple elements. Output to test the change. Change the rest of the colors, if needed, by using the Change the color of a single element instructions. Double-click the right-most color bar to open the color picker, select a color and hit OK and then Apply to set the color. Expand the color by clicking the black disclosure triangle. Control-click or Command-click each color to be changed. Double-click the right-most color bar to open the color picker, select a color and hit OK and then Apply to set the color. Double-click the right-most color bar of a single element, change it’s color via the Color Picker. Right-click on that bar, choose Copy. Right-click on next element, choose Paste. If you have multiple colors in the Color Tool which are similar but not equal, and you want to change them all at once do the following. Select the colors you want to change with Control [win] or Command [mac]-click. 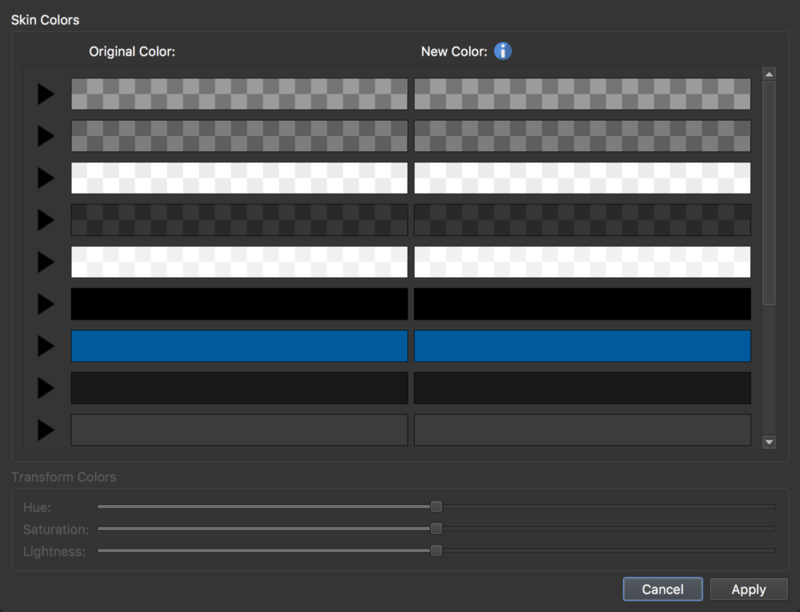 In the Transform Colors section below, drag the Hue, Saturation or Lightness sliders. The selected colors will change accordingly, while keeping their distance towards each other. ✭ Tip: You can even use the Color Tool to change the colors in SVG graphics!